Engraving, Anonymous, 7.6 (right) x 10.1 (bottom) (Hind, Rothschild Collection). Passavant, V, 1864, 171, 22, as Domenico Campagnola. Hind, V, 1948, 214-215, no. 17, VII, 1948, Pl. 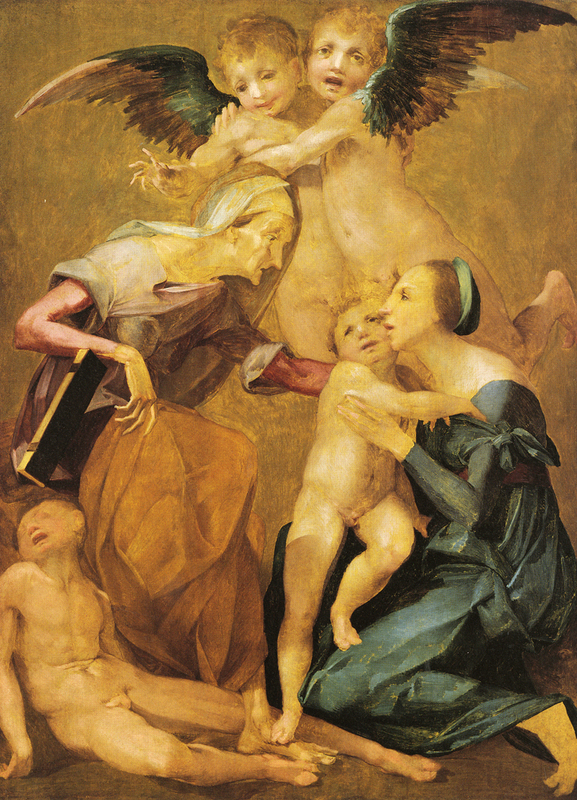 798.17, as Manner of Domenico Campagnola. The Picture Gallery of Andrea Vendramin, London, 1923, Pl. 52. Meiss, 1966, 357 and Fig. 40, and 1976, 222, 237, n. 71, Fig. 248, as Circle of Domenico Campagnola. The abundance of the garlands, as in the decoration of the Cleobis and Biton wall in the Gallery of Francis I, their suspension by lions’ heads, as above the Danaë (Fig.P.22, IV S a), although there seen in profile, and the cupid, which looks like so many of the putti in the gallery though none of them are asleep, all suggest that this engraving may preserve a fragment of a design by Rosso. In his total abandon to sleep the cupid also recalls the figure at the bottom of Rosso’s painting in Los Angeles (Fig.P.24a). 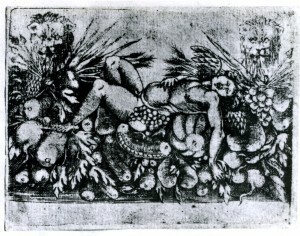 Sleeping figures of putti occur in two Rossoesque etchings by Fantuzzi (Fig.RE.21), and Zerner, 1969, A.F.42, and in another by him of Primaticcesque style (Zerner, 1969, A.F.55, and Zerner, in EdF, 1972, 268, Fig., 269, no. 319). The upper left putto in the latter etching is very similar to the cupid in the engraving, but in reverse. One suspects, however, that the etched putto is inspired by one by Rosso. 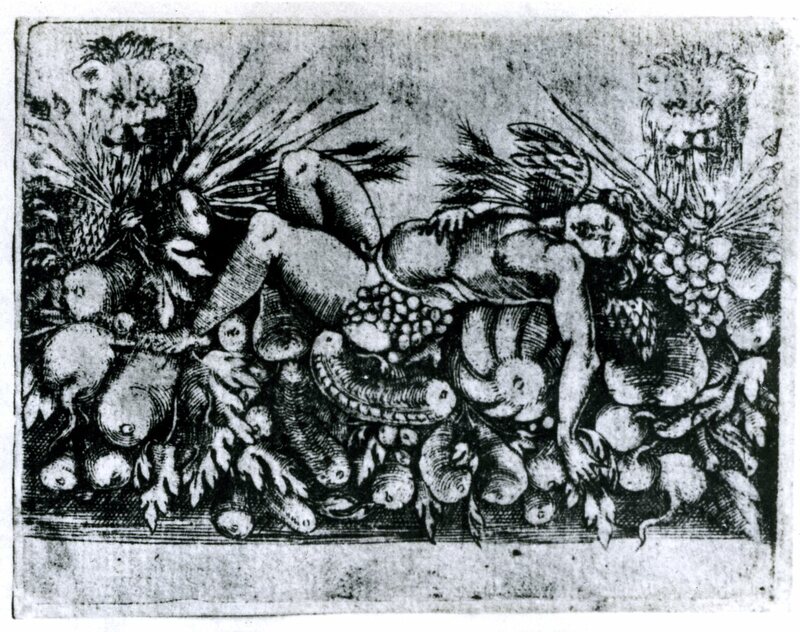 Putti reclining on garlands, but not asleep, can be seen in an anonymous cartouche framing two landscapes (Bartsch, XVI, 1818, 429, 131; Zerner, IB, 33, 1979, 406). One can imagine an invention by Rosso behind all these reclining figures. The extravagances of the engraved image strongly indicate such a source.